Mark Davis said his Cy Young Award-winning season of 1989 was a year when everything went right for him mentally. "Everything clicked at the same time. 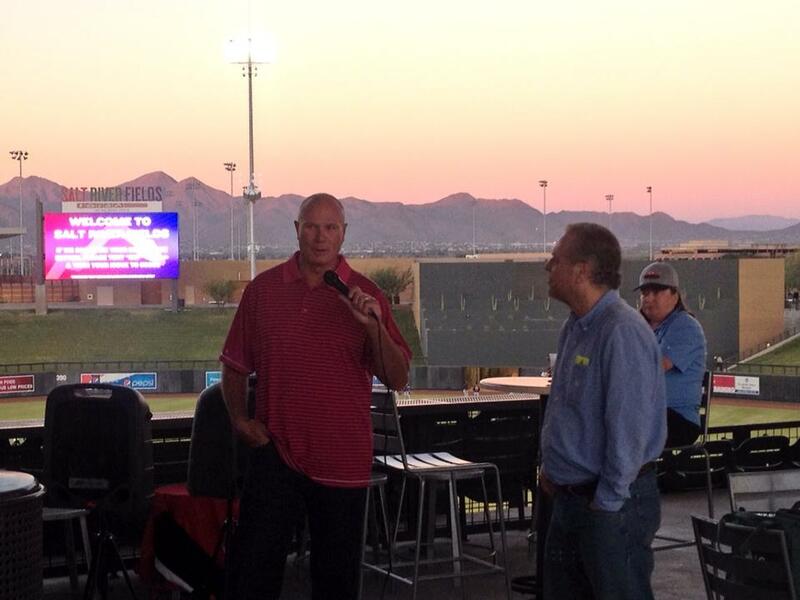 It was a snowball effect; you just have to ride the roll," Davis told a group of SABR Arizona Fall League Conference attendees on Friday night before a game at Talking Stick at Salt River Fields. Davis explained that he tries to emphasize the mental side of the game to the pitching prospects he coaches in the Kansas City Royals organization today. "I try to teach the kids to trust what they do, to believe in their stuff," said Davis, who spent 15 years in the majors with the San Francisco Giants, San Diego Padres, Royals, Philadelphia Phillies, Atlanta Braves and Milwaukee Brewers. "If you reach this level, most everyone has the physical attributes to be successful," he said. "But who has that sixth tool upstairs? Can you have success and do it consistently? Can you keep your focus all season long? The mental game is so important." Davis, who led the National League with 44 saves and had a 1.85 ERA in 1989 with the Padres, said he also works closely with young catchers to pay attention to how their pitchers are developing. "You'll see catchers who work a lot about receiving the ball, on the running game, on calling the game," he said. "But the catching prospects who stand out are the ones who take pride in the 12 pitchers we have on staff. ... I want him to get inside the pitchers' heads, to know what they're thinking. 'Do you know me? Do you know my tendences? Are we on the same page?' The more he understands what we're trying to accomplish (as pitchers), the more he will excel as a catcher." Davis also answered questions from the SABR crowd about such topics as pitch counts for minor leaguers, playing with Hall of Famer Tony Gwynn, and the perceived rise in pitcher injuries. "Now you have Tommy John surgery and other procedures that can help prolong a career. In the old days, a guy gets an elbow injury and you'd never hear from him again. Now they're rehabbing and recovering and coming back to play." The Arizona Fall League Conference continues through November 2. On Saturday morning, attendees will join members of SABR's Flame Delhi (Arizona) Chapter for their regional fall meeting. Saturday night is always a highlight of the conference as the top prospects from every organization participate in the AFL Fall Stars game. This page was last updated June 10, 2016 at 3:41 pm MST.